MP Julian Huppert is giving the city’s South Asian restaurants the chance to cause a stir nationally as he supports the Tiffin Cup competition for the third year running. Julian is encouraging nominations for the annual competition designed to find the best South Asian restaurant in the country. He is calling on restaurant owners across Cambridge to take part following the success of the city’s Saffron Brasserie last year and Cocum in 2011. 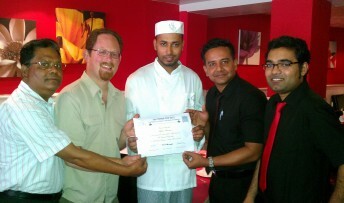 Both restaurants were named as runners up in the regional finals of the competition run by a cross-party group of MPs. This year all proceeds will be donated to World Vision which raises money to transform the lives of the poorest people in the developing world. Julian said: “This is a great competition which celebrates the best of South Asian cuisine across the country. “It’s a real opportunity for the city’s finest restaurants to earn recognition nationally while at the same time putting Cambridge on the map.